Look, if you want to make it in the competitive world of podcasting, you have to recognize every possible advantage. Conventional wisdom has always stressed the first three steps: get your mic sorted, pick a good theme (“wacky news” or “super niche pop culture history” are always safe bets), and send out preliminary sponsorship queries to Casper, Squarespace, and Blue Apron. But there’s another, equally important secret that all successful pod-people know, and it’s the magic of the “podcast co-host top,” which, like an actual podcast co-host, has returned to public consciousness after a period of silence. 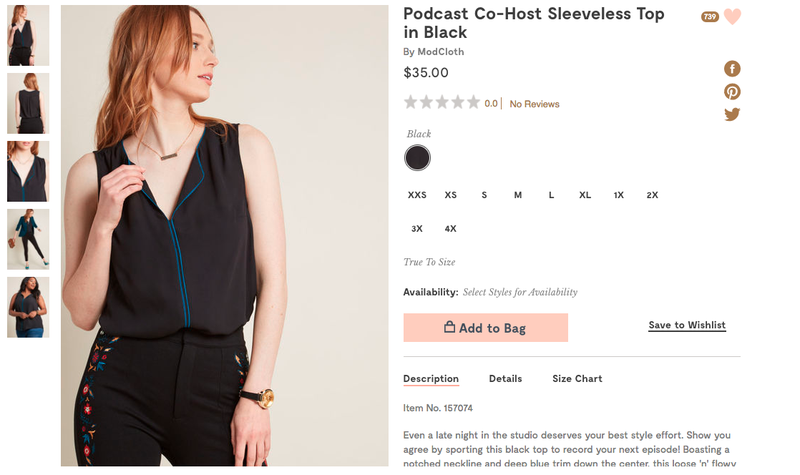 Created by the hip, internet-savvy folks at ModCloth, the latest version of the podcast co-host top is set to become the new uniform of web radio following an early attempt at introducing the item. While it may look like nothing more than a straightforward, sleeveless black blouse, the company tells its sore-throated buyers that the top “makes your outfit just as clever as the insights you share with your digital audience.” How? Nobody is quite sure, though the internet is hard at work trying to puzzle it out with a heavy dose of its trademark skepticism. While naysayers are busy complaining about branding, others are trying to look past the mysterious ad copy to the merits of the item itself. Even its admirers, though, are missing the most crucial aspect of the top’s design. Podcasting is usually thought of as something done entirely with the voice, but the medium’s top artists know something rarely discussed: in order to convey enthusiasm from bedroom to Soundcloud, top podders gesticulate wildly to underscore their points. The listener may not hear it, but this physicality marks the difference between the amateurs and pros. The “podcast co-host top” understands that established hosts are capable of performing these gestures in any clothes, but that co-hosts need sleeveless tops to learn the trade. That ModCloth has recognized this speaks volumes about its expert knowledge of the podcaster’s work. We should (after setting a noise gate to offset audio spikes) applaud them, which, once you’ve bought the top and begun enjoying completely free arm movement, is very easy to do.